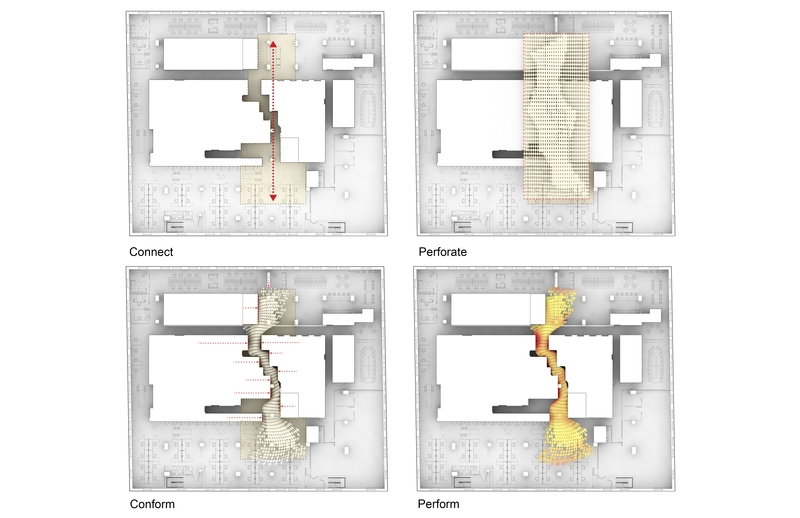 The design for the 14th floor office expansion needed to accommodate a diverse collective of professions and promote interaction and collaboration. The floor plate consists of a large core that created an obstacle for flexibility, flow and security. Two main elements where designed to combat these shortcomings – an animated ceiling and decorative security gate. Both objects work to invite guests down corridors that would have otherwise been long, uninspired spaces. The ceiling navigates through a narrow and jagged corridor that changes density with the changing in the width of the space. Each petal of the ceiling is unique in its shape and coloring with over 800 acrylic pieces. 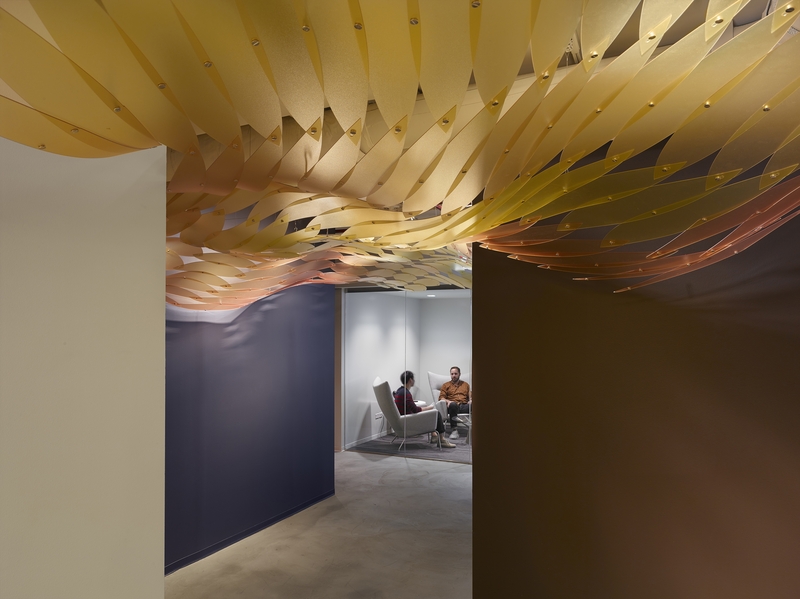 The design team organized fabrication files and hung individual pieces to a series of ceiling attachments. The ceiling becomes a luminous attraction for employees and guest to travel through a shortcut that would otherwise been overlooked. The gate also provides an animated atmosphere with a digitally patterned wood screen filtering light that embellishes the ground. Over 50’ long, the gate in its unused position decorates a long blank corridor leading to office spaces. In its used position, the gate provides security to the space by limiting access off the main elevators. Birch plywood panels are milled by CNC giving careful attention to the radius of cut edges to showcase the materiality of the wood. The pattern for the gate is derived from the inverse patterning and surface inflections of the ceiling petals giving a binding, yet abstract relationship between these two elements. 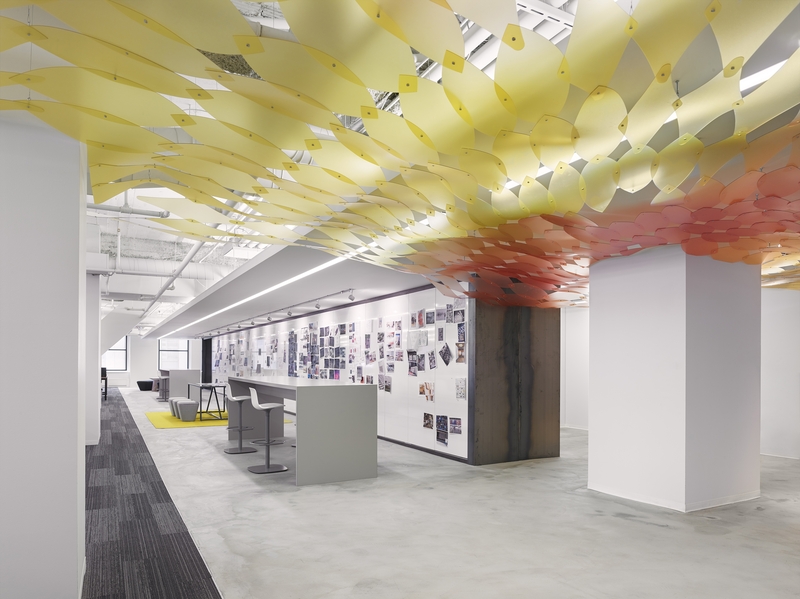 Ultimately, the multitude of unique parts and pieces connected together into holistic form reflects the collaborative and creative environment of this office.